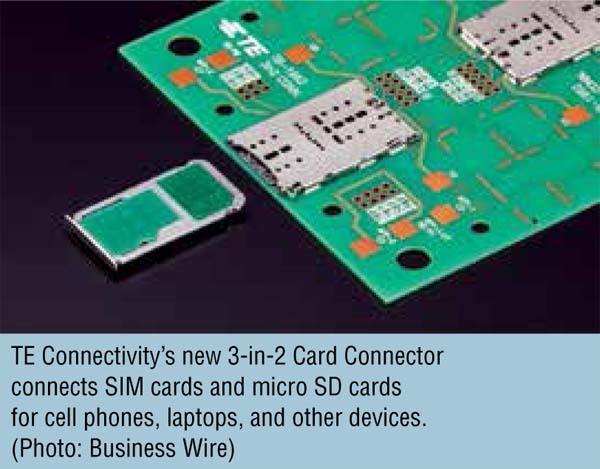 HARRISBURG, Pa.–A new 3-in-2 card connector developed by TE Connectivity (TE) is characterized by a space-efficient design that enables SIM and micro SD card connectivity in mobile phones, tablets, ultraportable devices, and personal computers. The card connector has two cavities, providing the flexibility to accept either two SIM cards or one SIM card and one micro SD card. This design feature is reported to save about 20 percent of PCB space over other combination-type card connectors. TE Connectivity's new 3-in-2 card connector uses an anti-buckling contact design that is said to facilitate more robust connections by preventing damage to cards during insertion and removal. Its space-efficient design incorporates a push-pin type feature with a mechanical lock function. According to TE, improved co-planarity control across the connector helps ensure fewer defects and easier soldering during the manufacturing process. "Device manufacturers want high density and the ability to provide flexibility to their end users," said Tommy Yu, product manager of Data and Devices at TE Connectivity, in a company release. "Our new 3-in-2 card connector provides both. Our engineers have designed a smaller, more robust connector that improves connection reliability and enables more compact mobile designs."